VATICAN CITY (CNS) — Pope Francis told the heads of women’s religious orders from around the world that he would set up a commission to study the New Testament deaconesses and he also insisted more can and should be done to involve lay and consecrated women in church decision-making at every level. The pope spent more than an hour May 12 responding to questions posed by members of the International Union of Superiors General, repeatedly asking if they wanted further clarification and making funny asides or rephrasing his responses when it was clear they were not hitting the mark. 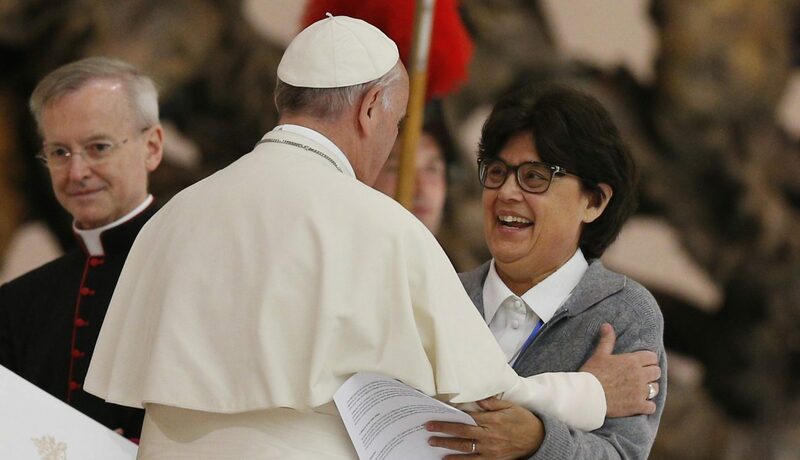 Asked about deaconesses in the New Testament and the possibility of the modern church admitting women to the permanent diaconate, Pope Francis had said his understanding was that the women described as deaconesses in the Bible were not ordained like permanent deacons are. Mainly, he said, it appeared that they assisted with the baptism by immersion of other women and with the anointing of women. Pope Francis also promised to have the Congregation for Divine Worship and the Sacraments send the UISG a full explanation of why women cannot give a homily at Mass. While women can preach at a Liturgy of the Word when there is not a celebration of the Eucharist, he said, at Mass the Liturgy of the Word and the Liturgy of the Eucharist are parts of a whole and only one who is ordained can preside and preach. All the baptized — women and men, lay or consecrated — have been given gifts by the Holy Spirit for the good of the entire church, he insisted. The entire church suffers when some voices are excluded from the conversation, he said. “Our desire is that the church talk with us — like is happening now — and not about us,” one of the sisters told him. “To talk about someone when they are absent is not evangelical,” the pope said. In the meetings of the Congregation for Institutes of Consecrated Life and Societies of Apostolic Life, “you must be present and I will tell the prefect this,” he said. “I never imagined there was such a disconnect, truly. Thank you for telling me so courageously and for doing so with that smile,” he said. While warning that “the devil enters through one’s pocket,” Pope Francis also urged the superiors to choose their treasurers well, be suspicious of “friends” who promise to invest and increase their money and to ensure that their evangelical poverty is a life of simplicity, not misery.